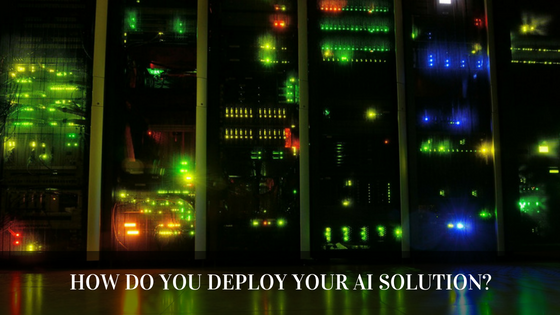 How do you Deploy your AI Solution? With custom AI solutions becoming increasingly common in many companies, one might ask: “How do I deploy my machine learning models in production use?”. There are many solutions to this problem, including hosting the machine learning solution using a company called Seldon. In this blog post, I interview Andrew Turner, Business Development Manager at Seldon. He has a proven and consistent track record helping customers deploy algorithm-related products across industries to start-ups and large enterprise, and he previously scaled ad-tech startup revenue from $4m to $60m p/a. He is also a Rugby player and coach. Seldon was span out of a recommendation engine company called Rumple Labs run by Seldon’s CEO and CTO. They provided content recommendations driven by algorithms to the largest media companies like Trinity Mirror group. They learnt the challenges and importance of having the right infrastructure to deploy AI driven intelligence. They also recognized an opportunity due to the higher barrier to entry. Seldon pivoted out of Rumble Labs in 2014 and now has thousands of data science teams deploying their machine learning models into production. What Problem Does Seldon Solve? Seldon helps data science teams deploy their machine learning models into production faster and safer, saving DevOps teams 25% of their time and saving businesses between $1 million – $13 million p/a of AI infrastructure investment. What Does Seldon do, and why is it Important to Your Customers? Seldon Core is an open source platform for deploying machine learning models on Kubernetes. Seldon Core focuses on solving the last step in any machine learning project to help companies put models into production, to solve real-world problems and maximise the return on investment. Models — runtime inference executable for one or more machine learning models. Routers — route API requests to sub-graphs. E.g. to serve experiments such as AB Tests or more dynamic Multi-Armed Bandits. Combiners — combine the responses from sub-graphs. E.g. ensembles of models. Transformers — transform request or responses. E.g. transform feature requests. How Does Seldon use AI? Seldon enables data scientists to deploy models from any machine learning library or framework using microservices and containers. Seldon runs on any cloud provider, on-premise, or fully managed by Seldon. Seldon comfortably serves billions of predictions each month. Seldon Core includes meta algorithms to detect model bias, model concept drift and explain model decisions. Technology companies and businesses may not have a clear vision of how AI demand is evolving, however they recognise the enormous impact it has in the business and marketing industry. With AI constantly developing and new solutions being made everyday, wildly different strategies are being produced and the exact recipe for success is still uncertain. For this reason, it is essential that businesses adapt to the AI movement and begin to develop and use it within their businesses. If companies wait two to three years to establish an AI strategy then it is unlikely that it will regain momentum in this rapidly growing market. This general acceptance of the AI movement within the business and marketing world will no doubt accelerate the development of AI and machine learning models, making the value as well as the need for AI greater. The value for Artificial Intelligence is clear, just how big of an impact it will make to this industry is not. $2.9 trillion of business value generated from AI augmentation by 2021 (Gartner)! Artificial intelligence has already exceeded our expectations in a handful of years, carrying out human tasks deemed ‘too complex for a machine to carry out’. AI has not only made the tasks possible, but the solutions developed have overtaken the human workers, providing data far more accurate, reliable and faster than ever before. With no doubt AI bots and machine learning models will replace a variety of the traditional business and marketing jobs we know today. However this does not mean that there will no longer be any jobs in this field. The development of AI will open up new opportunities and create new jobs that currently are not in existence. Business managers will be have more time to focus on making important business decisions and developing customer relations instead of analysing and organising data. Whilst data scientists will have more time to continue to develop new and improved ML models and discover new algorithms and important metrics to predict. The hype about AI is huge, there is no doubt that over the next few years we will see AI being massively incorporated within Business and Marketing as well as a huge range of industries. There is no standard definition of the technology stack and the AI movement has emerged hundreds of small companies and startups making their say in the market. It will be interesting and exciting to see how this new industry and market will develop. Will groups of companies begin to converge towards similar solutions or will the market continue to explode outwards with new and intuitive ideas and solutions continuously begin developed and evolving the markets? Either way this is a exciting time for everyone involved within the AI movement, as well as those within the business and marketing industries ready to see great changes from the impact of AI. In this blog post, Andrew Turner gave interesting insights into the future of AI deployment.